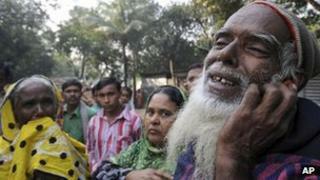 Bangladesh is observing a day of mourning for the more than 100 victims of a clothing factory fire on Saturday. Flags flew at half mast on government buildings and on garment factories and the three million workers in the industry were given a day's holiday. A burial is being held for those bodies too badly burnt to be identified. Meanwhile, police continued to hunt for the owner of the factory who they want to question about alleged violations of building regulations. The nine-storey Tazreen Fashions factory in the outskirts of the capital, Dhaka, only had building permission for three floors. Dhaka police chief Habibur Rahman said police had opened a murder investigation after reports that managers told workers to return to their machines as the alarms rang and the smoke spread. The Interior Minister, Mohiuddin Khan Alamgir, said a preliminary inquiry suggested the fire was the result of an arson attack on the building. The government has initiated two inquiries into the blaze. He said those responsible would be arrested: "We are determined that these saboteurs are brought to book. "At the same time we would like to assure everyone here and abroad that our production process will continue with no limitations. No obstacles will be allowed to stand in its way." Earlier, US retailer Walmart said it was troubled that a supplier subcontracted work without authorisation to the Tazreen factory. Walmart said it was cutting ties with the supplier without naming the firm. "The fact that this occurred is extremely troubling to us, and we will continue to work across the apparel industry to improve fire safety education and training in Bangladesh," the firm said in a statement. Labels of clothes from the European chain C&A, Hong Kong's Li & Fung and the US rapper and actor Sean "Diddy" Combs were also found in the factory. Witnesses said the Tazreen factory lacked emergency exits. Twelve people leapt to their deaths from windows as they tried to escape. "This disastrous fire incident was a result of continuing neglect of workers' safety and their welfare," Amirul Haque Amin, the president of Bangladesh's National Garment Workers Federation, was quoted as saying by Reuters news agency. "Whenever a fire or accident occurs, the government sets up an investigation and the authorities - including factory owners - pay out some money and hold out assurances to improve safety standards and working conditions. But they never do it." For a second day, garment workers staged protests in Dhaka and in the Ashulia industrial district where the Tazreen and many other clothes factories are located. Fatal fires are common in Bangladesh's large garment manufacturing sector. Eight people were injured in a blaze in another garment factory on Monday. Bangladesh relies overwhelmingly on the export of clothes. The country earns about $20 billion a year from the industry, 80% of its total exports. The US is its chief customer, buying almost a quarter of the total value of clothes.